Thank you for your nice comments on my Silent Cinema slide show. I have copied and pasted the Motion Picture Classics cover featuring Colleen Moore that you liked so much. I was unable to enlarge the image to standard photo size, but I hope the result is a good size. 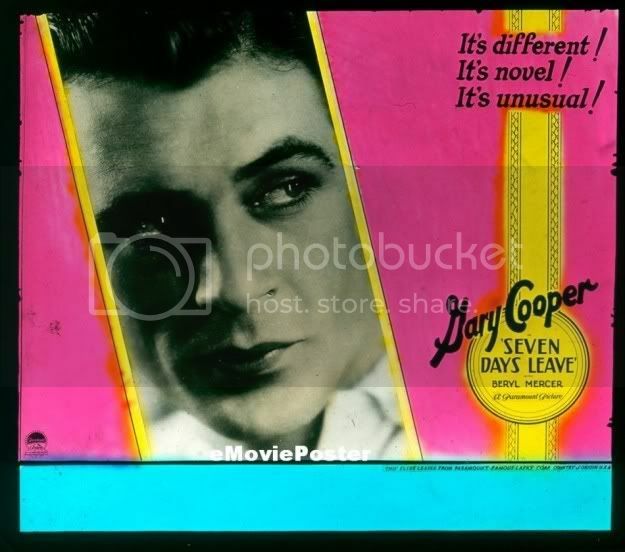 I noticed that there are a number of threads dedicated to film posters and lobby cards that cover every period in classic films. I thought it might be fun to start a thread for film posters and lobby cards from the silent era. Although this is the silent film forum, I thought we could also included sound pictures that feature actors and actresses who began their careers in the silent films. After reading Dr. Ed?s article on Ben Lyon, I chose a poster from a film that features both Ben Lyon and Bebe Daniels. I also wanted to include a poster from one of Louis Wolheim's sound pictures. I just watched Charlie Chaplin's *Modern Times*, and I loved it! The poster's pretty neat as well. Here are some neat glass slides that would have been shown before the movies to advertise either local stores, products, or films. It looks like we?re coming up to the intermission . Okay, back to the movies! 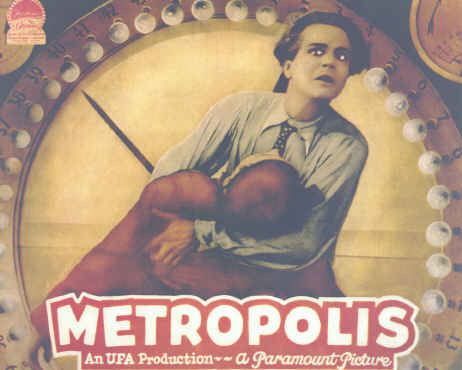 More *Metropolis* posters. I love this film, it's so captivating! I wish I would have watched the whole movie when TCM aired it a few days ago. I came in for the last 30 minutes of it. 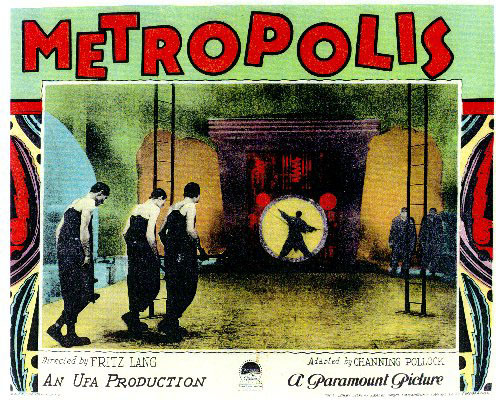 Thanks for sharing the film slides, the artwork and images from the silent era are really beautiful. I can also imagine a time when going to see a film meant the advertisement took the form of ?Please visit Johnson & Miles tailors for all your haberdashery needs. We are located at the corner of Maple Avenue & Main Street.? I would certainly prefer this type of advertisement to commercials for X-Box and a certain soda made in Atlanta. I am still figuring out how to post here. I registered with Photo-bucket about 10 days ago or so, but have only had limited success getting graphics up on these forums so far. I am working on it. I have much to contribute to this thread. Incidentally, I have all of the Pickford films you have noted here. Including DOROTHY VERNON OF HADDON HALL (1924), which is not a lost film. I sent you a couple selections from my score for THE COSSACKS again a couple days ago. Did you receive these? Thanks for the version of ROSE OF WASHINGTON SQUARE by the way. I will check and see if it was the one that I needed or not? I just reviewed Lewis Milestone's THE RACKET earlier in the week in another thread. Very good film, and you will enjoy seeing it allot tonight. I did get your email with the music from *The Cossacks* and I just haven?t had time to respond yet. I loved the music though and I bet it fits the film very nicely. I've got to stop half-way watching these silents! TCM airs them so late on Sunday, that I never make it through the whole film. One of these days, I'm going to watch *The Kid* in its entirety.